Activity 2 : Use of CCD Cameras. 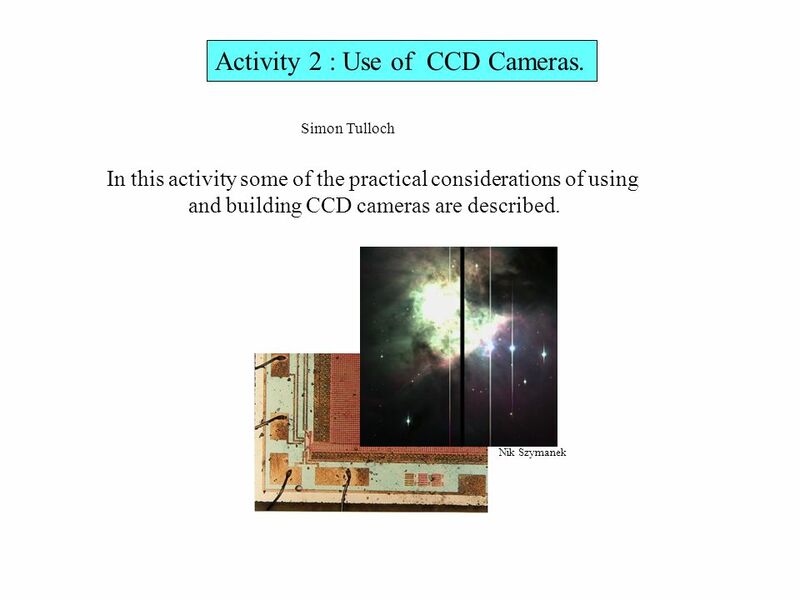 1 Activity 2 : Use of CCD Cameras. The graph below shows the transmission of the atmosphere when looking at objects at the zenith. The atmosphere absorbs strongly below about 330nm, in the near ultraviolet part of the spectrum. 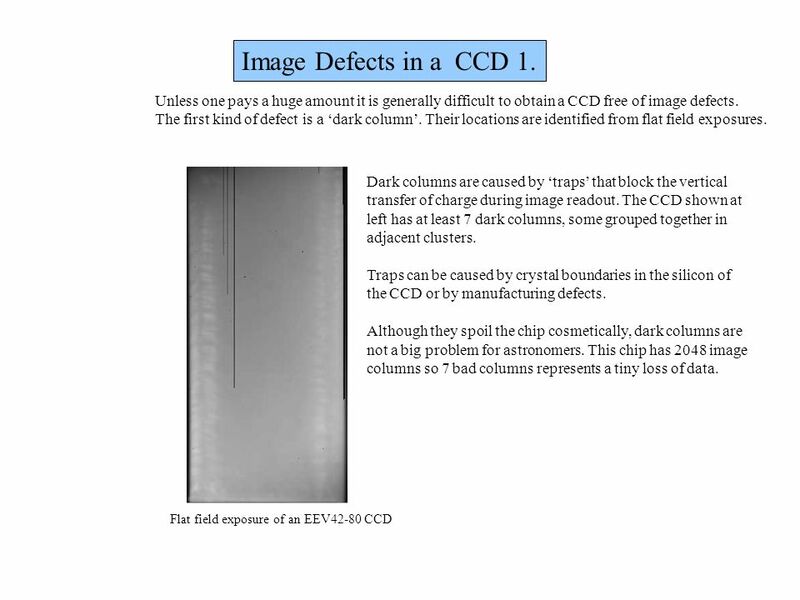 An ideal CCD should have a good sensitivity from 330nm to approximately 1000nm, at which point silicon, from which CCDs are manufactured, becomes transparent and therefore insensitive. 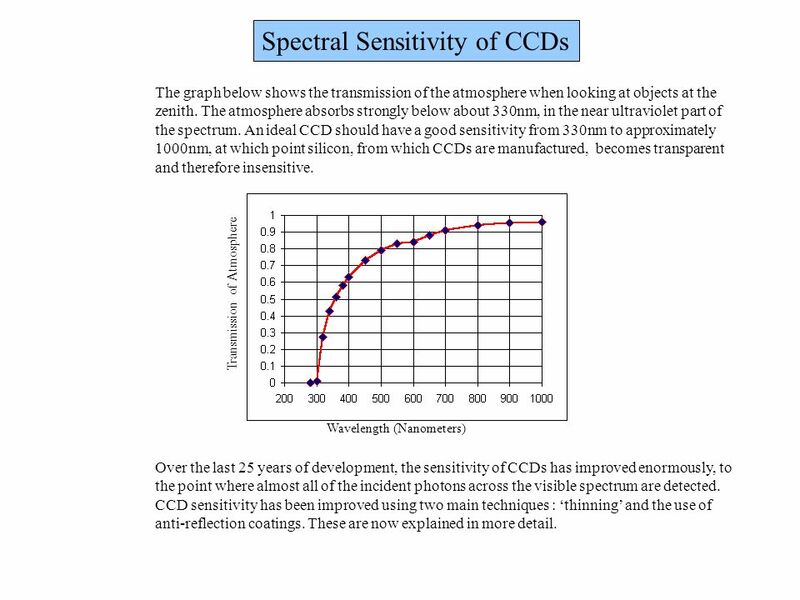 Wavelength (Nanometers) Transmission of Atmosphere Over the last 25 years of development, the sensitivity of CCDs has improved enormously, to the point where almost all of the incident photons across the visible spectrum are detected. CCD sensitivity has been improved using two main techniques : ‘thinning’ and the use of anti-reflection coatings. These are now explained in more detail. Incoming photons p-type silicon n-type silicon Silicon dioxide insulating layer 625mm Polysilicon electrodes These are cheap to produce using conventional wafer fabrication techniques. They are used in consumer imaging applications. Even though not all the photons are detected, these devices are still more sensitive than photographic film. They have a low Quantum Efficiency due to the reflection and absorption of light in the surface electrodes. Very poor blue response. The electrode structure prevents the use of an Anti-reflective coating that would otherwise boost performance. 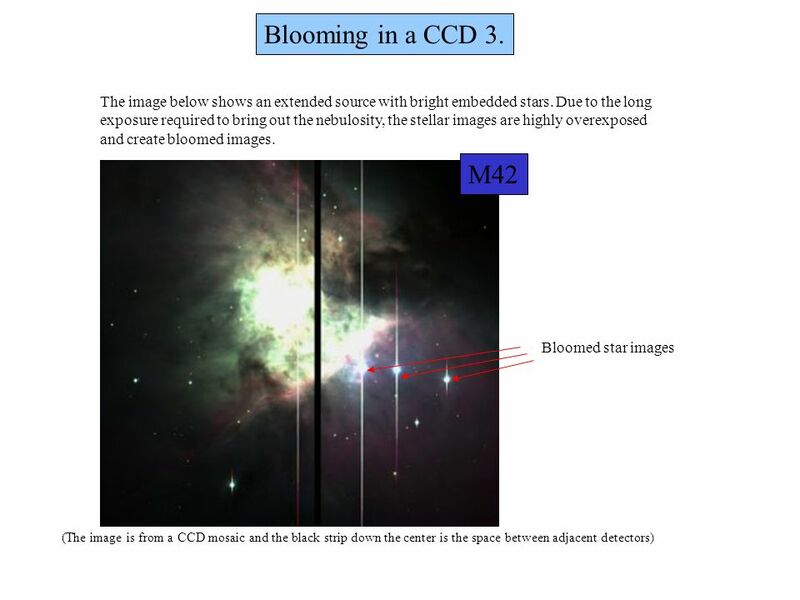 The amateur astronomer on a limited budget might consider using thick CCDs. For professional observatories, the economies of running a large facility demand that the detectors be as sensitive as possible; thick front-side illuminated chips are seldom if ever used. Silicon has a very high Refractive Index (denoted by n). This means that photons are strongly reflected from its surface. [ ] nt-ni nt+ni 2 ni Fraction of photons reflected at the interface between two mediums of differing refractive indices = nt n of air or vacuum is 1.0, glass is 1.46, water is 1.33, Silicon is 3.6. 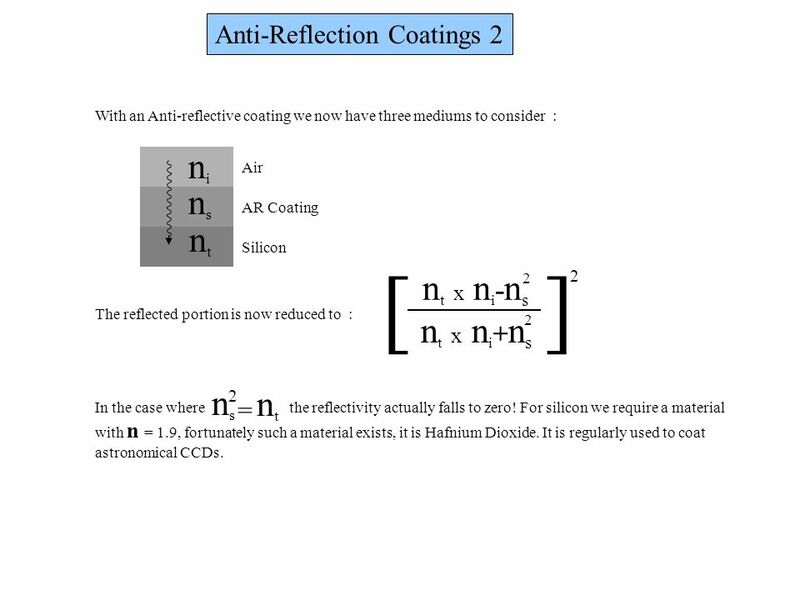 Using the above equation we can show that window glass in air reflects 3.5% and silicon in air reflects 32%. Unless we take steps to eliminate this reflected portion, then a silicon CCD will at best only detect 2 out of every 3 photons. 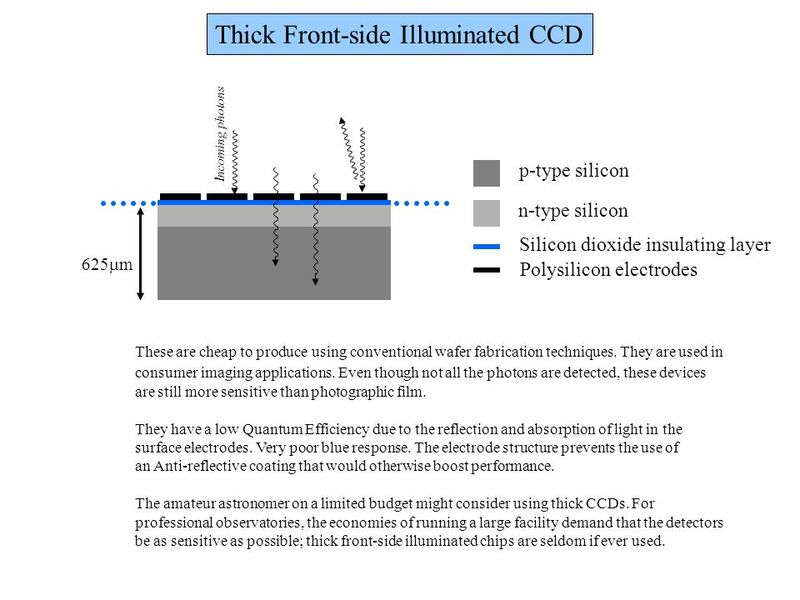 The solution is to deposit a thin layer of a transparent dielectric material on the surface of the CCD. The refractive index of this material should be between that of silicon and air, and it should have an optical thickness = 1/4 wavelength of light. The question now is what wavelength should we choose, since we are interested in a wide range of colours. Typically 550nm is chosen, which is close to the middle of the optical spectrum. 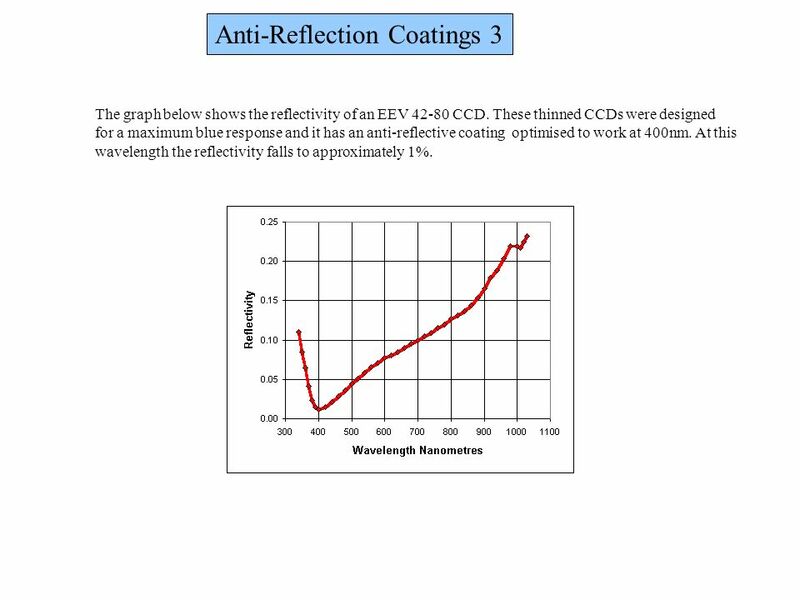 The graph below shows the reflectivity of an EEV CCD. These thinned CCDs were designed for a maximum blue response and it has an anti-reflective coating optimised to work at 400nm. At this wavelength the reflectivity falls to approximately 1%. 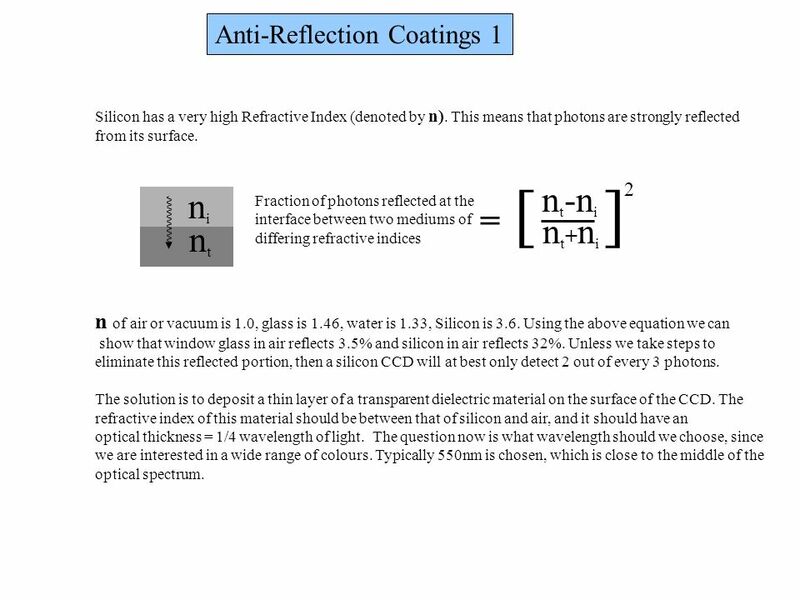 Anti-reflective (AR) coating Incoming photons p-type silicon n-type silicon Silicon dioxide insulating layer 15mm Polysilicon electrodes The silicon is chemically etched and polished down to a thickness of about 15microns. Light enters from the rear and so the electrodes do not obstruct the photons. The QE can approach 100% . These are very expensive to produce since the thinning is a non-standard process that reduces the chip yield. These thinned CCDs become transparent to near infra-red light and the red response is poor. Response can be boosted by the application of an anti-reflective coating on the thinned rear-side. 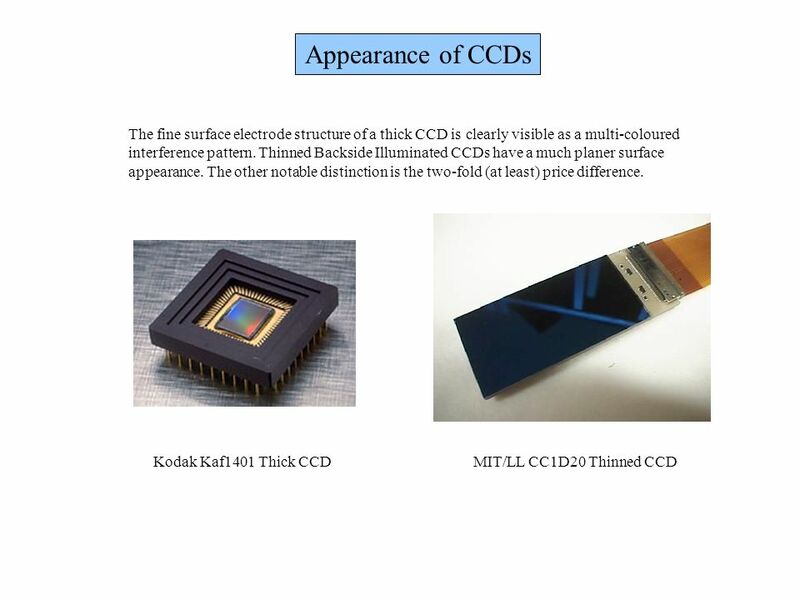 These coatings do not work so well for thick CCDs due to the surface bumps created by the surface electrodes. Almost all Astronomical CCDs are Thinned and Backside Illuminated. 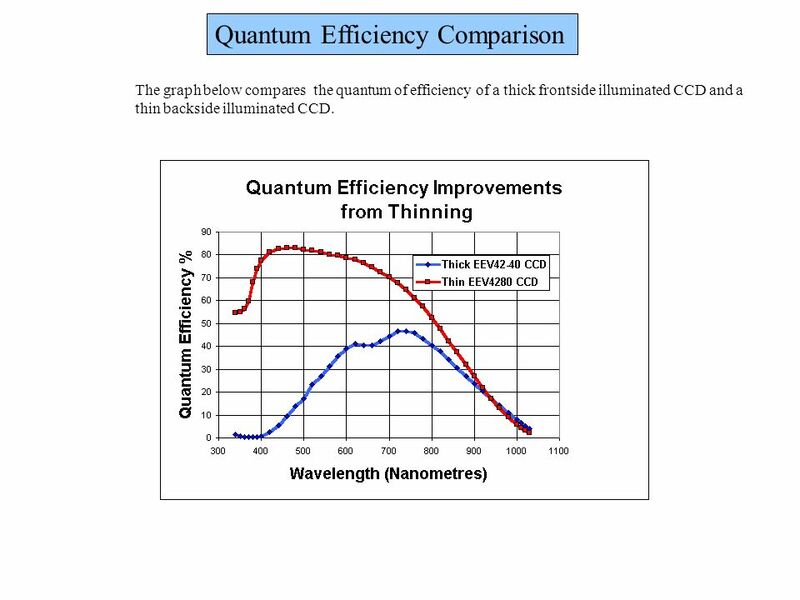 The graph below compares the quantum of efficiency of a thick frontside illuminated CCD and a thin backside illuminated CCD. 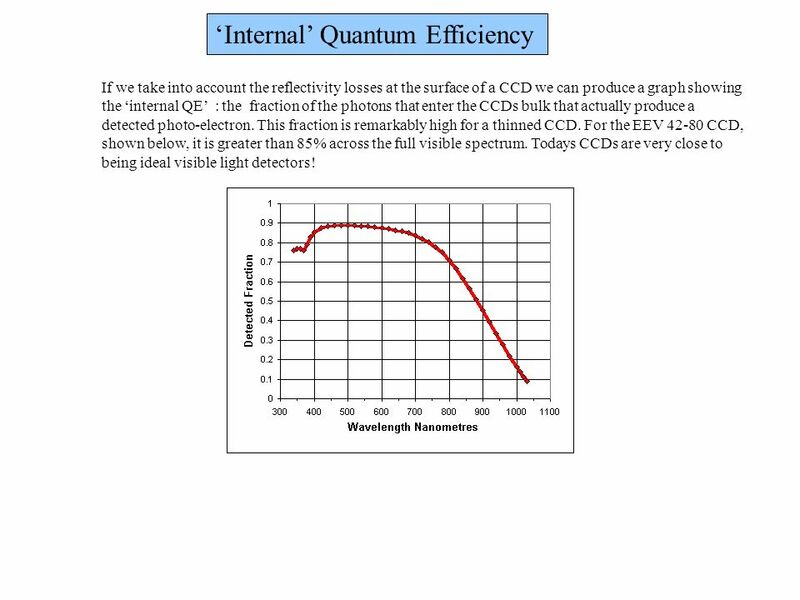 If we take into account the reflectivity losses at the surface of a CCD we can produce a graph showing the ‘internal QE’ : the fraction of the photons that enter the CCDs bulk that actually produce a detected photo-electron. This fraction is remarkably high for a thinned CCD. For the EEV CCD, shown below, it is greater than 85% across the full visible spectrum. 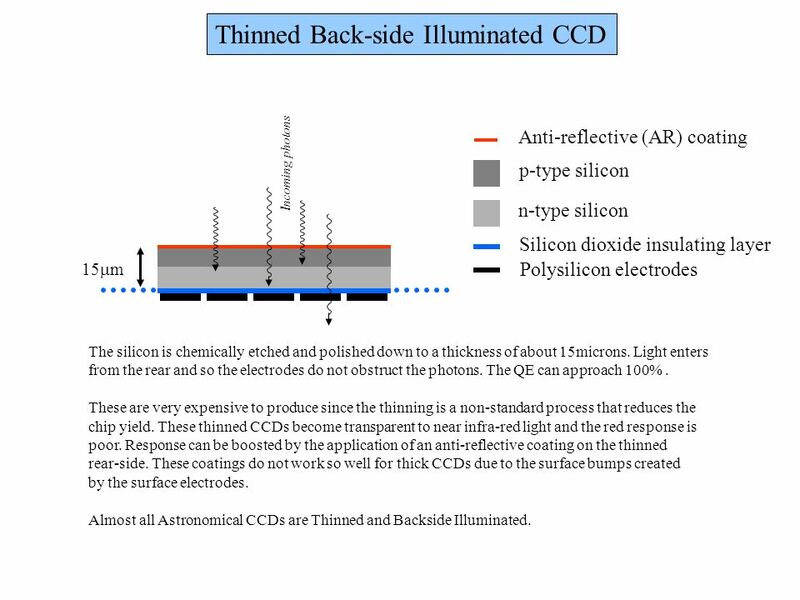 Todays CCDs are very close to being ideal visible light detectors! 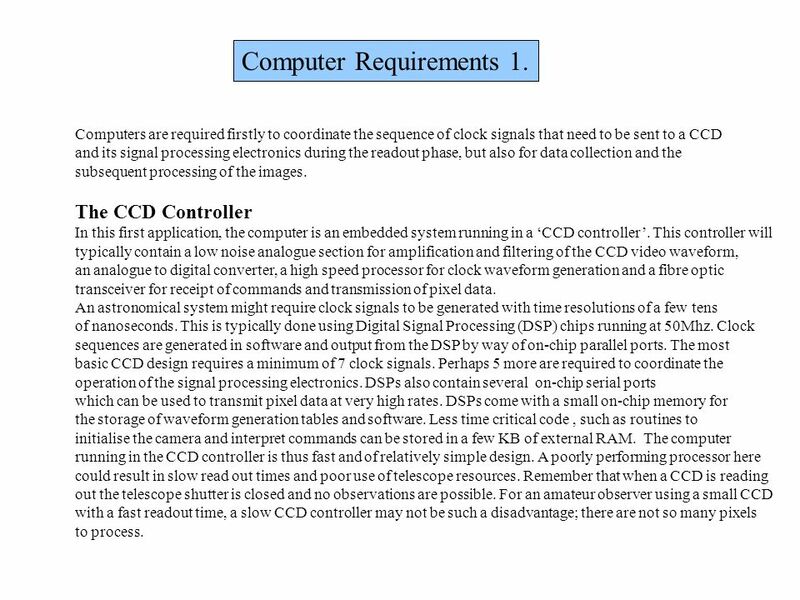 Computers are required firstly to coordinate the sequence of clock signals that need to be sent to a CCD and its signal processing electronics during the readout phase, but also for data collection and the subsequent processing of the images. The CCD Controller In this first application, the computer is an embedded system running in a ‘CCD controller’. This controller will typically contain a low noise analogue section for amplification and filtering of the CCD video waveform, an analogue to digital converter, a high speed processor for clock waveform generation and a fibre optic transceiver for receipt of commands and transmission of pixel data. An astronomical system might require clock signals to be generated with time resolutions of a few tens of nanoseconds. This is typically done using Digital Signal Processing (DSP) chips running at 50Mhz. Clock sequences are generated in software and output from the DSP by way of on-chip parallel ports. The most basic CCD design requires a minimum of 7 clock signals. Perhaps 5 more are required to coordinate the operation of the signal processing electronics. DSPs also contain several on-chip serial ports which can be used to transmit pixel data at very high rates. DSPs come with a small on-chip memory for the storage of waveform generation tables and software. Less time critical code , such as routines to initialise the camera and interpret commands can be stored in a few KB of external RAM. The computer running in the CCD controller is thus fast and of relatively simple design. A poorly performing processor here could result in slow read out times and poor use of telescope resources. Remember that when a CCD is reading out the telescope shutter is closed and no observations are possible. For an amateur observer using a small CCD with a fast readout time, a slow CCD controller may not be such a disadvantage; there are not so many pixels to process. 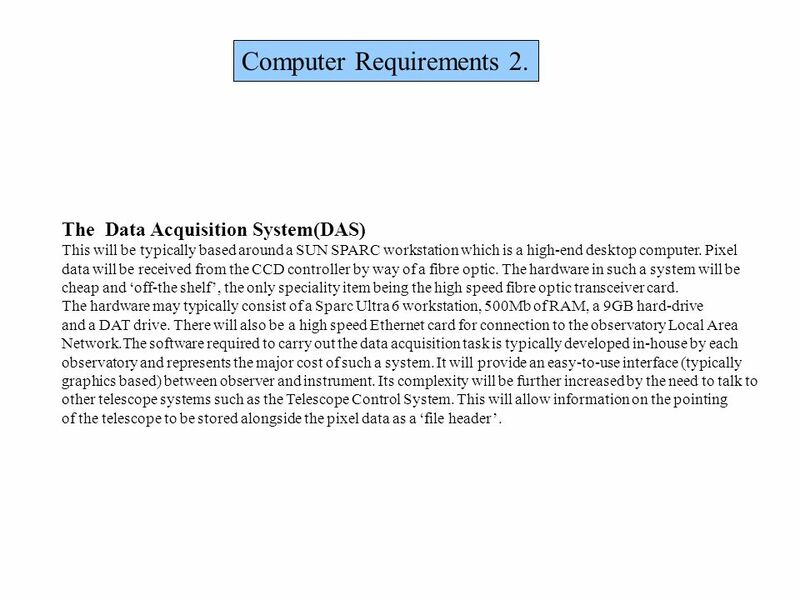 The Data Acquisition System(DAS) This will be typically based around a SUN SPARC workstation which is a high-end desktop computer. Pixel data will be received from the CCD controller by way of a fibre optic. The hardware in such a system will be cheap and ‘off-the shelf’, the only speciality item being the high speed fibre optic transceiver card. The hardware may typically consist of a Sparc Ultra 6 workstation, 500Mb of RAM, a 9GB hard-drive and a DAT drive. There will also be a high speed Ethernet card for connection to the observatory Local Area Network.The software required to carry out the data acquisition task is typically developed in-house by each observatory and represents the major cost of such a system. It will provide an easy-to-use interface (typically graphics based) between observer and instrument. Its complexity will be further increased by the need to talk to other telescope systems such as the Telescope Control System. This will allow information on the pointing of the telescope to be stored alongside the pixel data as a ‘file header’. Image Processing Computers (Contd.) This professional system is unusual in its high demands on disc space and RAM. The processor speed , however, is the same as that found in current PCs costing a few thousand dollars. An amateur observer with a small 1K square CCD camera will find a medium level PC quite sufficient for operation of the camera and for image processing. 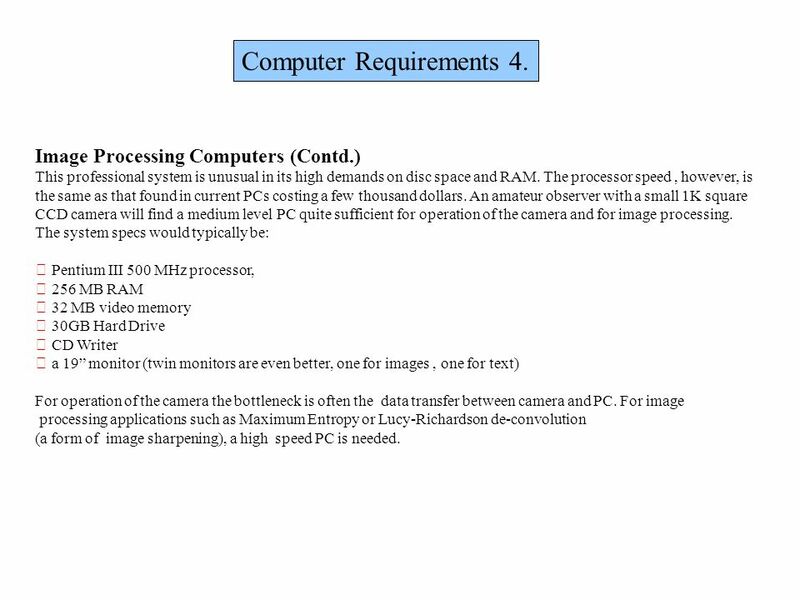 The system specs would typically be: Pentium III 500 MHz processor, 256 MB RAM 32 MB video memory 30GB Hard Drive CD Writer a 19” monitor (twin monitors are even better, one for images , one for text) For operation of the camera the bottleneck is often the data transfer between camera and PC. For image processing applications such as Maximum Entropy or Lucy-Richardson de-convolution (a form of image sharpening), a high speed PC is needed. 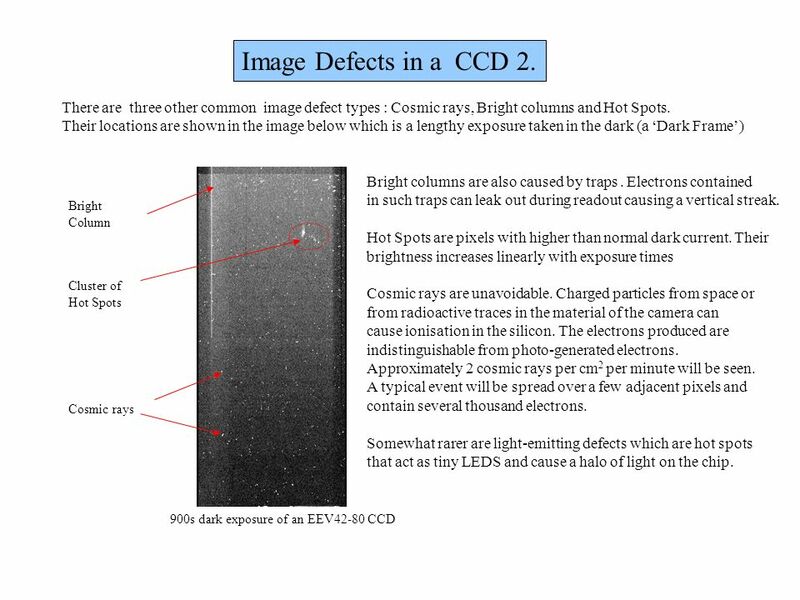 20 Image Defects in a CCD 3. Some defects can arise from the processing electronics. This negative image has a bright line in the first image row. M51 Dark column Hot spots and bright columns Bright first image row caused by incorrect operation of signal processing electronics. 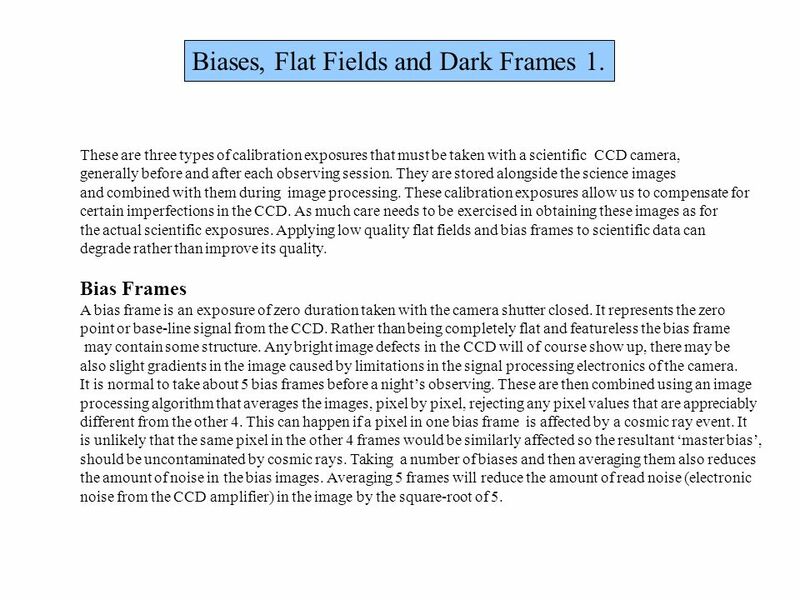 21 Biases, Flat Fields and Dark Frames 1. These are three types of calibration exposures that must be taken with a scientific CCD camera, generally before and after each observing session. They are stored alongside the science images and combined with them during image processing. These calibration exposures allow us to compensate for certain imperfections in the CCD. As much care needs to be exercised in obtaining these images as for the actual scientific exposures. Applying low quality flat fields and bias frames to scientific data can degrade rather than improve its quality. Bias Frames A bias frame is an exposure of zero duration taken with the camera shutter closed. It represents the zero point or base-line signal from the CCD. Rather than being completely flat and featureless the bias frame may contain some structure. 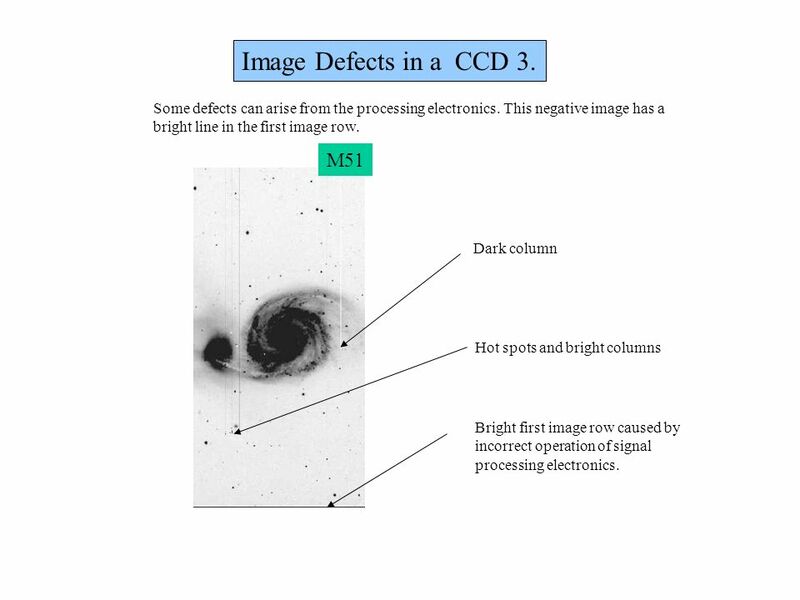 Any bright image defects in the CCD will of course show up, there may be also slight gradients in the image caused by limitations in the signal processing electronics of the camera. It is normal to take about 5 bias frames before a night’s observing. These are then combined using an image processing algorithm that averages the images, pixel by pixel, rejecting any pixel values that are appreciably different from the other 4. This can happen if a pixel in one bias frame is affected by a cosmic ray event. It is unlikely that the same pixel in the other 4 frames would be similarly affected so the resultant ‘master bias’, should be uncontaminated by cosmic rays. Taking a number of biases and then averaging them also reduces the amount of noise in the bias images. Averaging 5 frames will reduce the amount of read noise (electronic noise from the CCD amplifier) in the image by the square-root of 5. 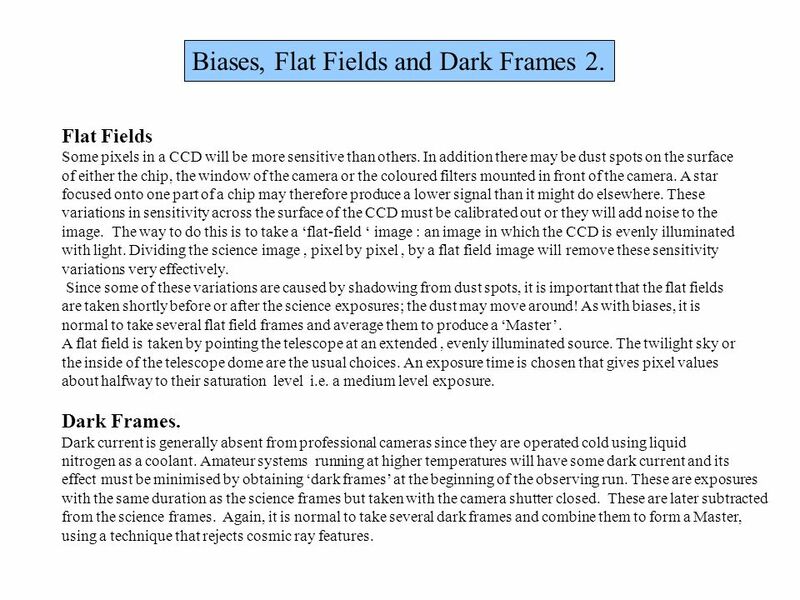 22 Biases, Flat Fields and Dark Frames 2. Some pixels in a CCD will be more sensitive than others. In addition there may be dust spots on the surface of either the chip, the window of the camera or the coloured filters mounted in front of the camera. A star focused onto one part of a chip may therefore produce a lower signal than it might do elsewhere. These variations in sensitivity across the surface of the CCD must be calibrated out or they will add noise to the image. The way to do this is to take a ‘flat-field ‘ image : an image in which the CCD is evenly illuminated with light. Dividing the science image , pixel by pixel , by a flat field image will remove these sensitivity variations very effectively. Since some of these variations are caused by shadowing from dust spots, it is important that the flat fields are taken shortly before or after the science exposures; the dust may move around! As with biases, it is normal to take several flat field frames and average them to produce a ‘Master’. A flat field is taken by pointing the telescope at an extended , evenly illuminated source. The twilight sky or the inside of the telescope dome are the usual choices. An exposure time is chosen that gives pixel values about halfway to their saturation level i.e. a medium level exposure. Dark Frames. Dark current is generally absent from professional cameras since they are operated cold using liquid nitrogen as a coolant. 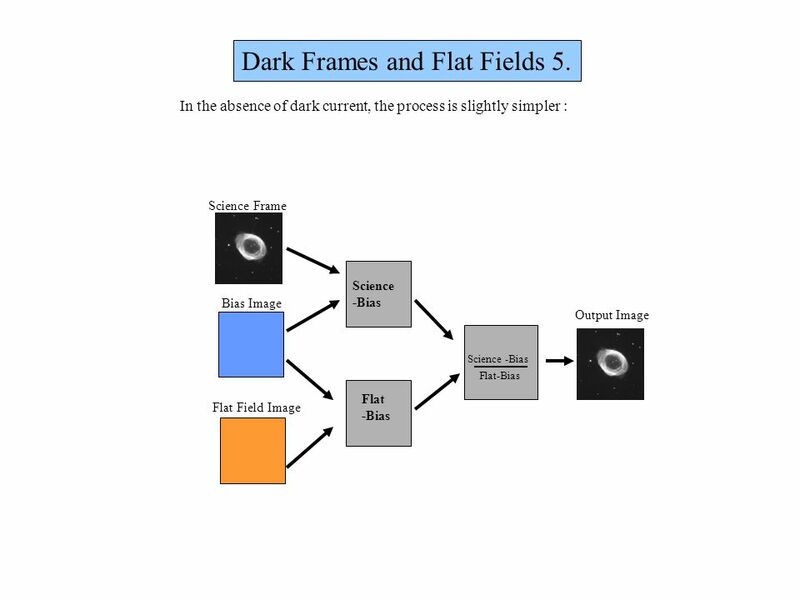 Amateur systems running at higher temperatures will have some dark current and its effect must be minimised by obtaining ‘dark frames’ at the beginning of the observing run. These are exposures with the same duration as the science frames but taken with the camera shutter closed. These are later subtracted from the science frames. Again, it is normal to take several dark frames and combine them to form a Master, using a technique that rejects cosmic ray features. 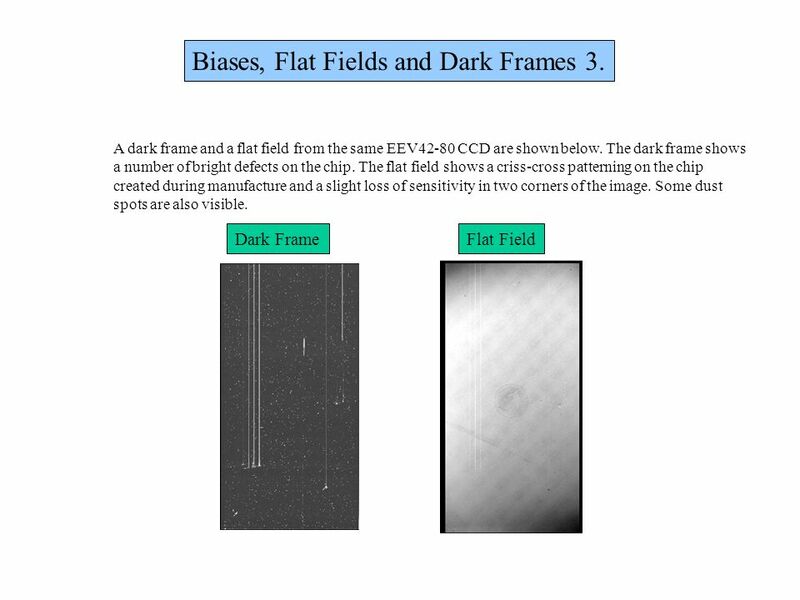 23 Biases, Flat Fields and Dark Frames 3. 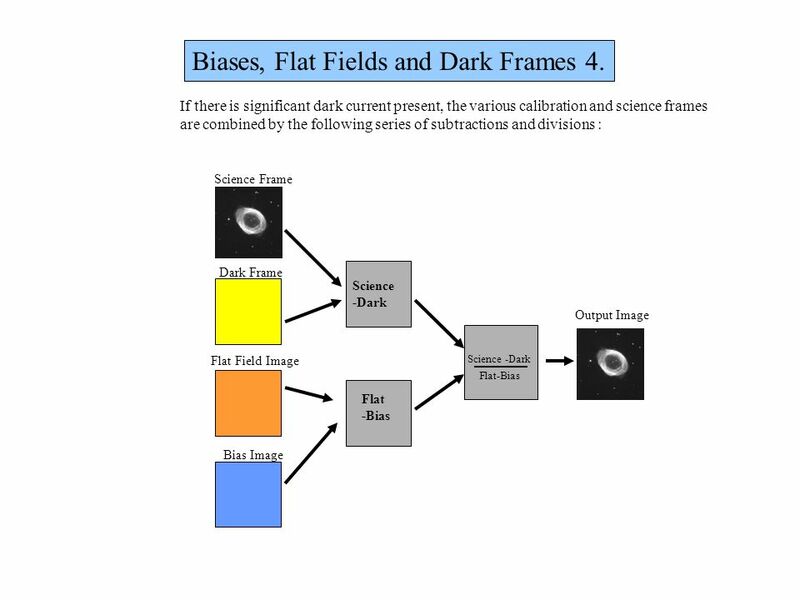 24 Biases, Flat Fields and Dark Frames 4. 25 Dark Frames and Flat Fields 5. It is important to match the size of a CCD pixel to the focal length of the telescope. Atmospheric seeing places a limit on the sharpness of an astronomical image for telescope apertures above 15cm. Below this aperture, the images will be limited by diffraction effects in the optics. In excellent seeing conditions, a large telescope can produce stellar images with a diameter of 0.6 arc-seconds. 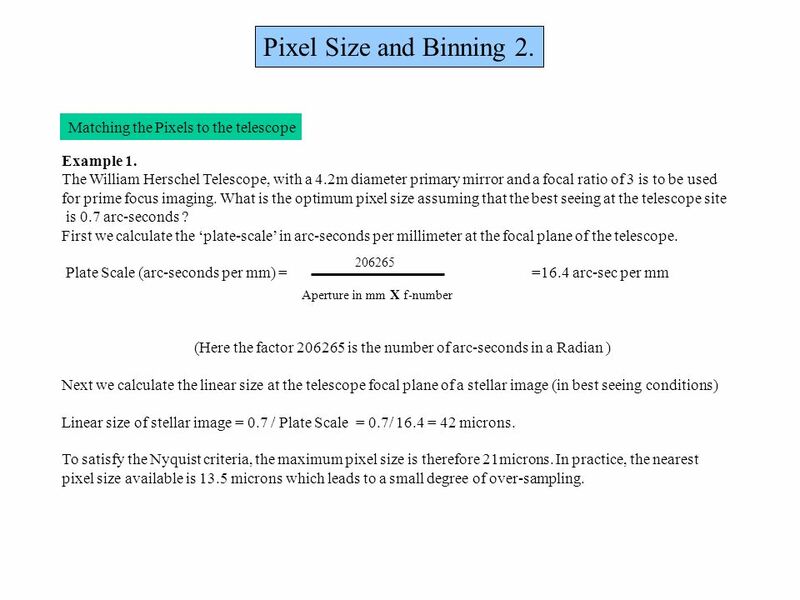 In order to record all the information present in such an image, two pixels must fit across the stellar image; the pixels must subtend at most 0.3 arc-seconds on the sky. This is the ‘Nyquist criteria’. 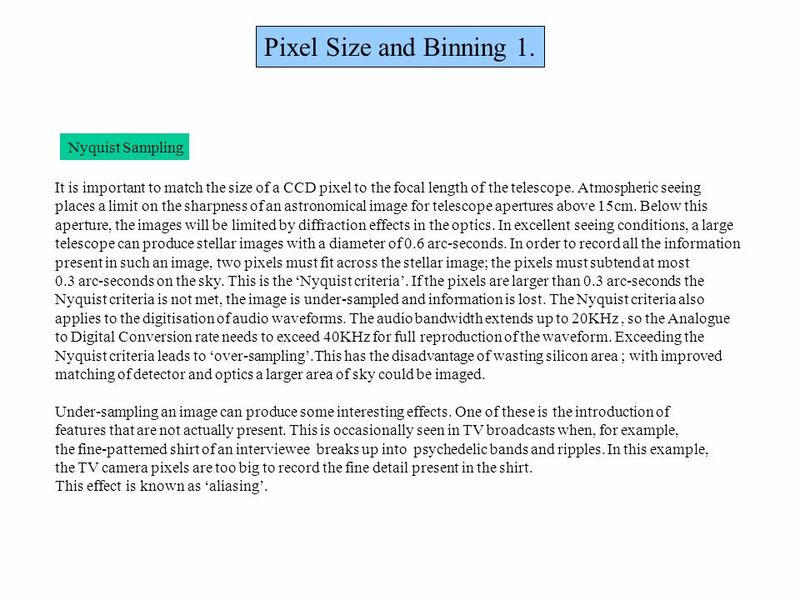 If the pixels are larger than 0.3 arc-seconds the Nyquist criteria is not met, the image is under-sampled and information is lost. The Nyquist criteria also applies to the digitisation of audio waveforms. The audio bandwidth extends up to 20KHz , so the Analogue to Digital Conversion rate needs to exceed 40KHz for full reproduction of the waveform. Exceeding the Nyquist criteria leads to ‘over-sampling’.This has the disadvantage of wasting silicon area ; with improved matching of detector and optics a larger area of sky could be imaged. Under-sampling an image can produce some interesting effects. One of these is the introduction of features that are not actually present. This is occasionally seen in TV broadcasts when, for example, the fine-patterned shirt of an interviewee breaks up into psychedelic bands and ripples. In this example, the TV camera pixels are too big to record the fine detail present in the shirt. This effect is known as ‘aliasing’. 28 Pixel Size and Binning 3. Example 2. In the first example we showed that with 13.5micron pixels the system exceeded the Nyquist Criteria even on nights with exceptionally good sub-arcsecond seeing. If we now suppose that the seeing is 2 arc-seconds, the size of a stellar image will increase to 120microns on the detector. The image will now be grossly over-sampled. (One way to think of this is that the image is less sharp and therefore requires fewer pixels to record it). It would be more efficient now for the astronomer to switch to a detector with larger pixels since the resultant image files would be smaller, quicker to read out and would occupy less disc space. 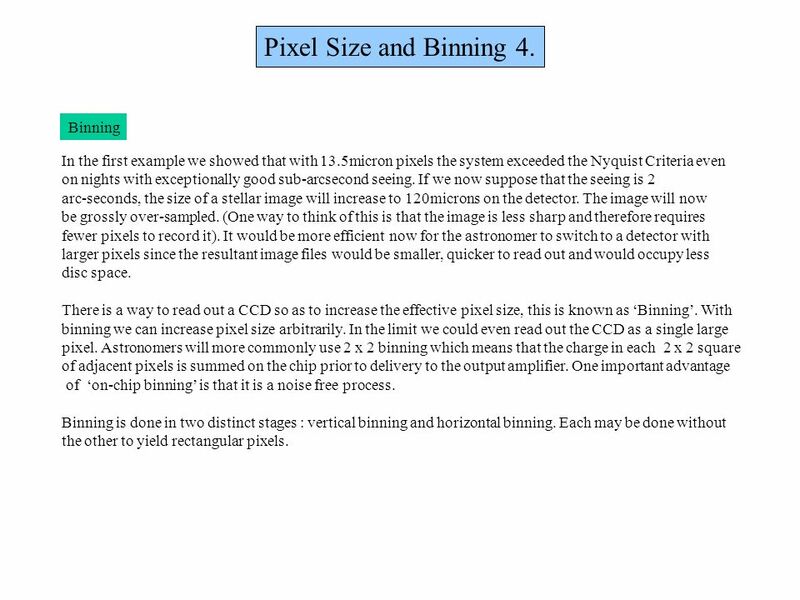 There is a way to read out a CCD so as to increase the effective pixel size, this is known as ‘Binning’. 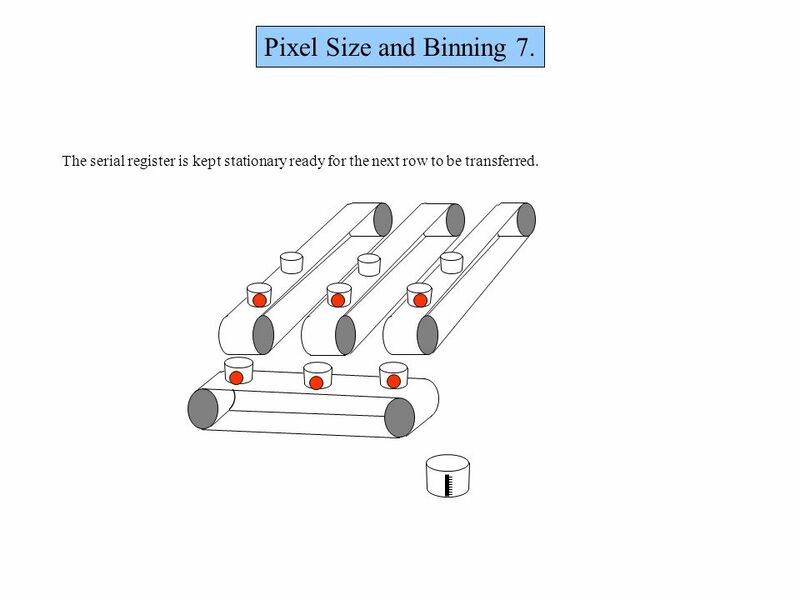 With binning we can increase pixel size arbitrarily. 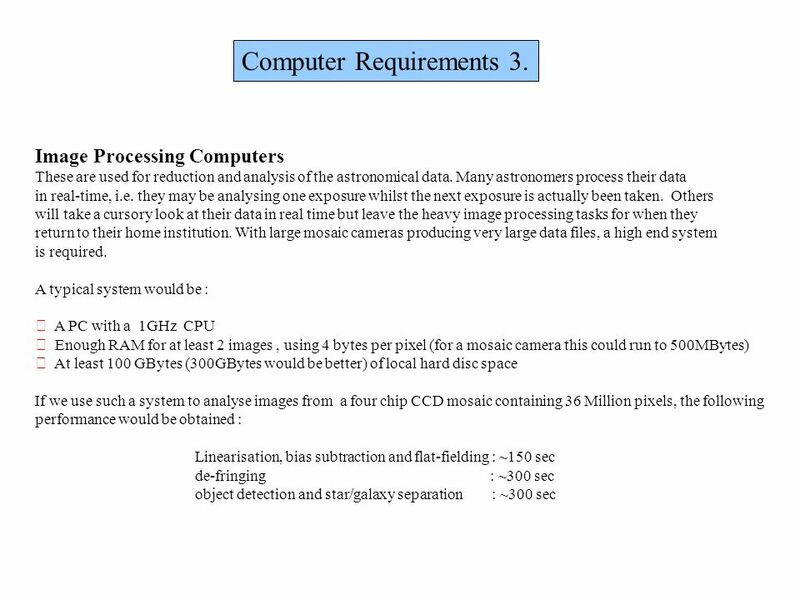 In the limit we could even read out the CCD as a single large pixel. Astronomers will more commonly use 2 x 2 binning which means that the charge in each 2 x 2 square of adjacent pixels is summed on the chip prior to delivery to the output amplifier. 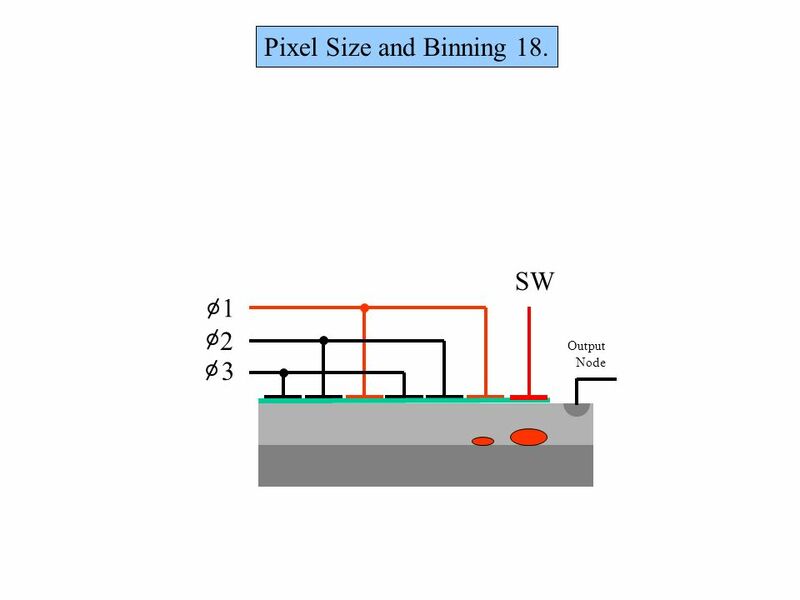 One important advantage of ‘on-chip binning’ is that it is a noise free process. Binning is done in two distinct stages : vertical binning and horizontal binning. Each may be done without the other to yield rectangular pixels. 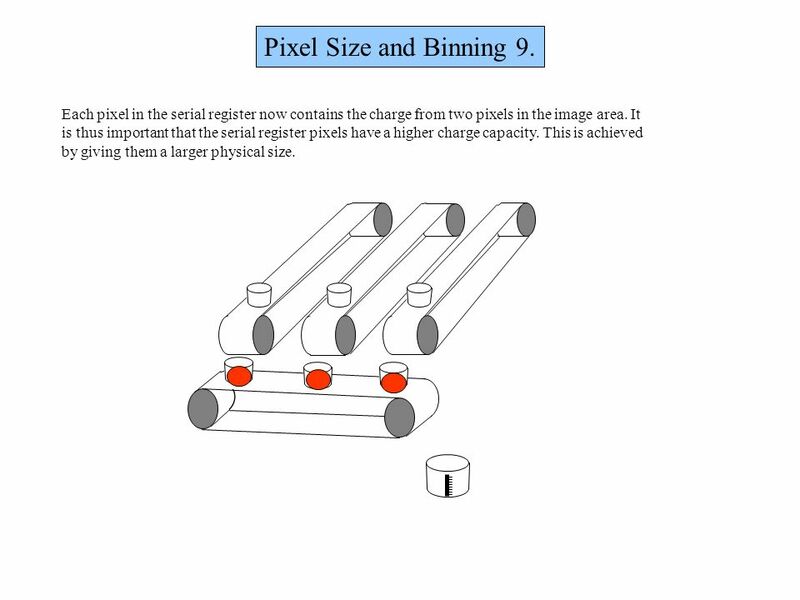 32 Pixel Size and Binning 7. The serial register is kept stationary ready for the next row to be transferred. 33 Pixel Size and Binning 8. The second row is now transferred into the serial register. 34 Pixel Size and Binning 9. 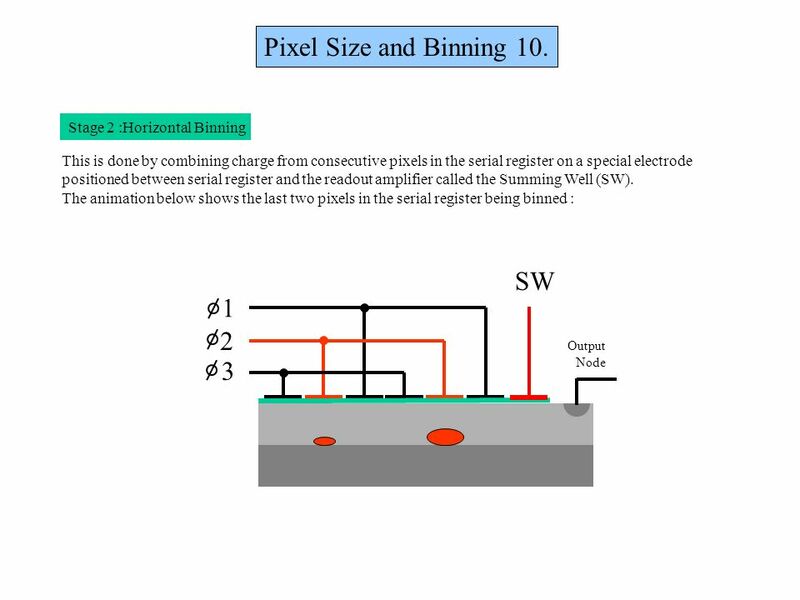 Each pixel in the serial register now contains the charge from two pixels in the image area. It is thus important that the serial register pixels have a higher charge capacity. This is achieved by giving them a larger physical size. 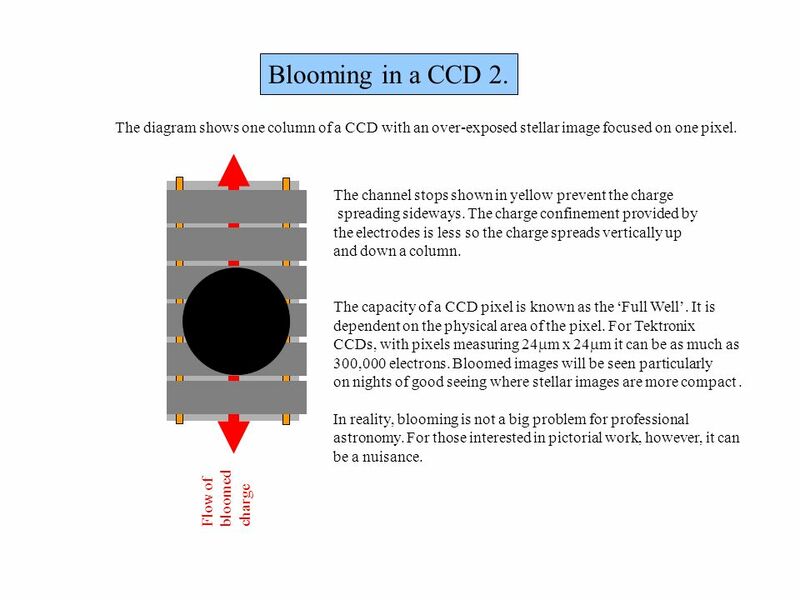 Download ppt "Activity 2 : Use of CCD Cameras." 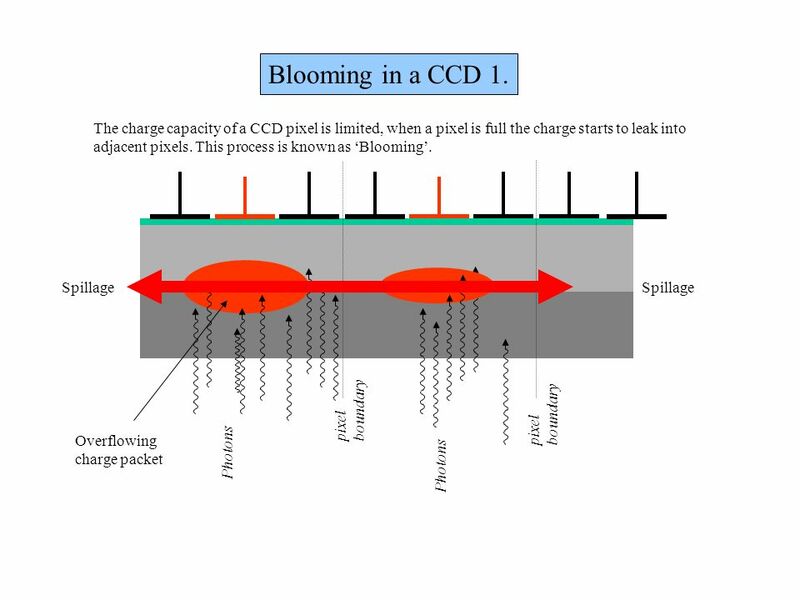 Activity 1 : Introduction to CCDs. Radio Astronomy By looking at the radio part of the EM spectrum, we can get a different perspective on the nature of the universe. the atmospheric window. Charge Couple Devices Charge Couple Devices, or CCDs operate in the charge domain, rather than the current domain, which speeds up their response time. Fisica Generale - Alan Giambattista, Betty McCarty Richardson Copyright © 2008 – The McGraw-Hill Companies s.r.l. 1 Chapter 25: Interference and Diffraction. Kamera CCD Astronomi (2) AS3100 Lab. Astronomi Dasar I Prodi Astronomi 2007/2008 B. Dermawan. Optical Astronomy Imaging Chain: Telescopes & CCDs. Storey: Electrical & Electronic Systems © Pearson Education Limited 2004 OHT 26.1 Data Acquisition and Conversion  Introduction  Sampling  Signal Reconstruction. GG450 April 22, 2008 Seismic Processing. Photodiodes Photons incident on the depletion layer induce a current. 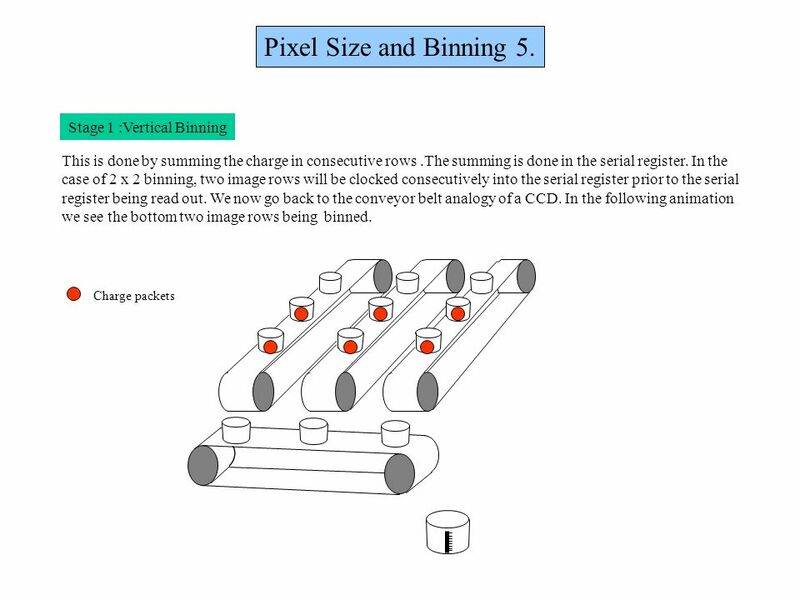 Charge-Coupled Devices Astrophysics Lesson 5. Learning Objectives Describe and explain the structure and operation of the charge coupled device State.